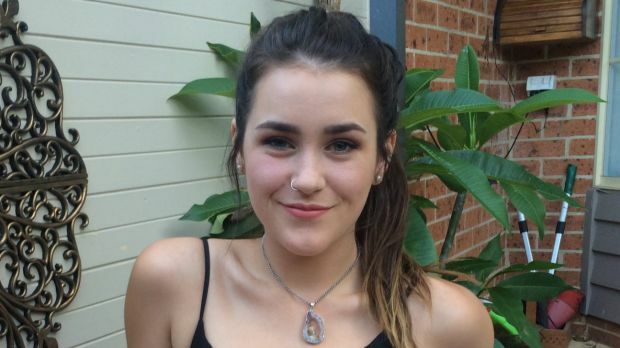 A Sydney train has once again become a battleground for racial tolerance after a young woman was subject to a vicious tirade from a fellow passenger. 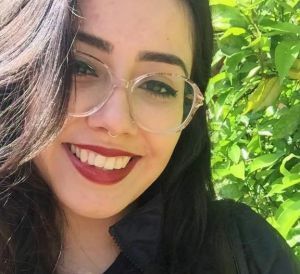 Natalie Soto, 20, was speaking Spanish to her mother over the phone as she rode a train into the Sydney CBD on Thursday morning. “My mum just wanted to make sure I had caught the right train. Her English isn’t very good so I was speaking to her in Spanish,” Ms Soto said. She could hear the angry grumblings of a woman sitting two rows in front of her but was shocked when she realised the woman’s gripe was with her. The incident is the latest in a string of racial tirades filmed by commuters on Sydney trains and buses. In April a Muslim couple from Brisbane were the targets of an anti-Islamic rant by a woman on a train on their way to Sydney airport with their four-month-old son. A female passenger filmed the exchange, and was praised for standing up for the couple. 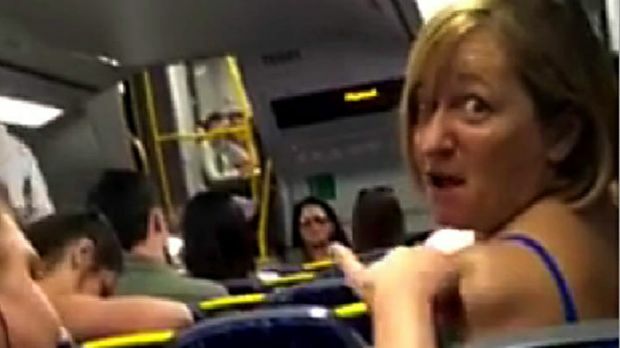 A 55-year-old woman was arrested at Wyong Train station after she was filmed unleashing a racist tirade, targeting children and an Asian woman on a packed peak-hour train. Ms Soto said she initially paid no attention to the woman. “I didn’t really take any notice until she turned around and looked at me and said ‘get that dirty wog off the train, she’s giving me a headache’,” Ms Soto said. “I thought ‘okay, this is about me’,” she said. But Ms Soto’s fellow passengers soon came to her defence. That’s when Ms Soto started recording the scene on her camera phone. “It’s not English. Why should we have to listen to f—ing rambling,” the woman can be heard saying on the recording Ms Soto posted to Facebook. “Because we are a multicultural country,” a young woman fires back as she swivels around in her seat in view of Ms Soto’s camera phone. “Are we?” the blonde woman says. “Unless you’re Aboriginal, you have come from another country to live here. We’re all from different cultures,” the young woman responds. “Yes, just look at the carriage,” Ms Soto replies, referring to her fellow passengers. “We speak English in this country. If you can’t speak it in public don’t speak it [sic] at all,” the blonde woman said. The woman seemed to be taken aback that Ms Soto responded in English, the 20-year-old said. “Lucky for you I can speak multiple languages and I can understand exactly what’s going on,” Ms Soto said. “Speak it in your own home, don’t speak it in public,” the blonde woman responded. “Does it make you uncomfortable?” Ms Soto asks. “Yeah it does,” the woman responded. “I think you really need to question yourself,” Ms Soto said. “Do you want me to speak my f—ing language and see how you f—ing like it?” the blonde woman says. “So her speaking another language is not okay but you saying the c-word in front of children is okay,” said the same young female passenger who spoke up earlier. She was referring to a comment made by the blonde woman before the recording had started, according to Ms Soto. The Australian born retail assistant, born to a Chilean mother and German father, said it was not the first time she had been called a “wog” or copped unpleasant comments from strangers who overheard her speaking Spanish. But her encounter on the train was by far the most aggressive, she said. “It has never been such a public outburst. There was so much anger there,” she said. Ms Soto said she didn’t film the woman to shame her, but to highlight the everyday racism she believed was an enduring problem that needed to be addressed. “The point was to show people that this is a very real issue in Australia. It’s not just me. It’s more than that,” Ms Soto said. “But I know people like her [the blonde woman on the train] are just a minority of really small minded, bigoted and [prejudiced] people. It’s really comforting to know that,” she said. She was also heartened by the response from her fellow passengers’ response. “I didn’t get to speak to or thank the beautiful girl who stood up for me. She was lovely. “I’d really like to find her and say thanks,” she said. The young man sitting next to her had also cheered her up, telling her he thought Spanish was a beautiful language, Ms Soto said. “He said: ‘Don’t ever let someone tell you the way you are is a bad thing’,” she said. A Sydney Trains staff member has been in contact with the 20-year-old regarding the incident. Ms Soto is also planning to make a formal complaint to police. The “lovely” girl who stuck up for Ms Soto during the tense confrontation is 19-year-old university study Nikki Strong. Ms Strong reached out to Ms Soto after seeing news reports of the incident on Friday evening and the two women, both psychology undergraduates, have bonded over the experience. “We definitely want to meet up. We’ve found we have a lot in common,” Ms Strong said. The 19-year-old said she had on occasion heard offensive comments during train trips, but nothing as vehement as Thursday’s incident. “When I started sticking up for Natalie she called me a c— and said she was going to spit on me and my boyfriend,” Ms Strong said. “There were children … under five years old … sitting literally five metres from us,” she said. Ms Strong said she was driven to defend Natalie because she couldn’t stand the idea of a carriage full of people sitting in silence as one of their number was the target of racial slurs. “Someone had to say something,” she said. “I honestly just felt really bad that it happened to Natalie, and I hope people can learn from this and acknowledge that we live in a multicultural nation and have to respect people’s languages,” she said.